Planning a trip to Cades Cove in the Smoky Mountains? As the most visited region of the Great Smoky Mountains National Park, Cades Cove is a must-see during your vacation! With stunning mountain views, amazing wildlife like bear, deer, and turkey, and beautiful historic cabins, this impressive area in the national park is a truly special place. The only thing better than driving the 11-mile Cades Cove loop road is exploring this region's excellent hiking trails. To help you get the most out of your visit to this scenic valley, we've made this handy guide with the 5 best hiking trails in Cades Cove! 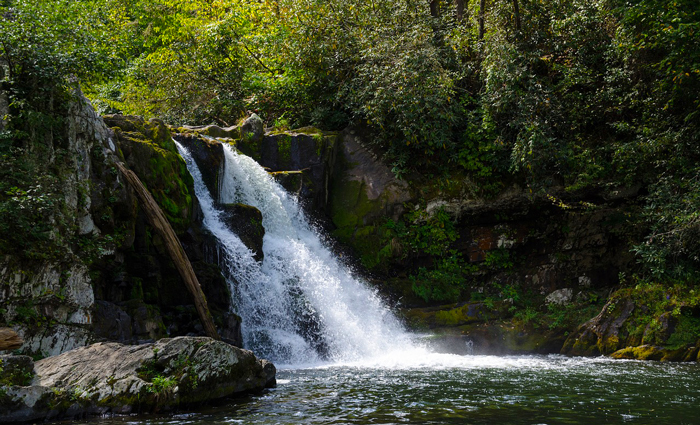 The hike to Abrams Falls is a truly classic hike in the Smoky Mountains. It's also arguably the most popular hiking trail in all of Cades Cove. This beautiful trail takes visitors the impressive 20 ft fall Abrams Falls waterfall. Though these falls aren't the tallest in the Smokies, they are among the most powerful and the largest in water-flow volume in the national park. This moderately difficult hike is a 5.1-mile round-trip and it takes about 3-4 hours to complete. It passes through lovely sections of pine and mountain laurel forest. After climbing and descending several ridges, the trail descends to the Abrams Creek Gorge. Once you reach the falls, you'll first see a large scenic mountain pool and a large sandstone cliff. There's even a nice beach area at the base of the falls where you can relax and feel the cool air coming off the falls. Near the beginning of the trailhead, you can also make a short detour to visit the Elija Oliver cabin that's is only 0.5 miles away. How To Get There: The trailhead for the Abrams Falls Trail is on the Western end of the Cades Cove Loop road. To reach it, enter the loop road and drive 4.8 miles. On your right, you'll see a sign for Abrams Falls and a gravel road to the parking lot for the trailhead. Another popular hike in Cades Cove is the Rich Mountain Loop trail, a nice hike that offers historic cabins, wildflowers, and nice views of the Cades Cove valley. This peaceful trail is an excellent way to get away from the crowds if you find yourself in Cades Cove on a busy day. This trail climbs up Rich Mountain, so though there are some strenuous sections, they are well worth the views of Cades Cove below. After hiking 1.4 miles on this trail, you'll reach the John Oliver cabin, a structure that was built by the first European residents of the Cove. Dating from the 1820s, this is one of the oldest structures in the national park. At 2.9 miles in length one-way, the Rich Mountain Loop Trail is the perfect length for a manageable day hike. Alternatively, combining the Rich Mountain Loop Trail, Indian Grave Gap Trail, and the Crooked Arm Ridge Trail, hikers can make a nice loop hike which is 8.5 miles in length. How To Get There: The trailhead for the Rich Mountain Loop Trail begins 50 feet after the entrance to the One-way Cades Cove loop road. To hike this trail, simply park outside of the loop trail and hike along the loop road to reach the trailhead. This challenging hike takes visitor along the Gregory Ridge Trail to Gregory's Bald, a stunning high elevation Appalachian mountain bald filled with wildflowers and impressive views of Cades Cove and its surrounding mountains. High elevation balds are known for being a hotbed for plant and animal life, so it's a must-see for anyone who loves the natural beauty of the Smokies. During the month of June, visitors to Gregory's Bald can also enjoy the bloom of its flame azaleas. These stunning wildflowers bloom in gorgeous colors ranging from red to orange to yellow to pink to create an impressive tapestry of flowers. The trail to Gregory's Bald is somewhat strenuous, as it requires that you climb over 3000 vertical feet in about 5 miles. The round trip distance is 11.3 miles, so this hike can easily take most of a day to complete. All the same, the views from Gregory's Bald are well worth the effort and this hike is considered one of the best hikes in Cades Cove and the Smoky Mountains. How To Get There: Take the Cades Cove loop road to the western end of the cove and turn right onto the Parson Branch/Forge Creek road just after you pass the Cable Mill Visitors Center. Please note that this road is sometimes closed, so you may have to hike on it to reach the trailhead. This gravel road is 2.2 miles in length. This hike is arguably one of the most strenuous routes in the Smokies, so it is primarily recommended for experienced hikers. That being said, the highlights of this hike are some of the most impressive sights you can enjoy in the Smoky Mountains, so the hard hiking is well worth the effort. 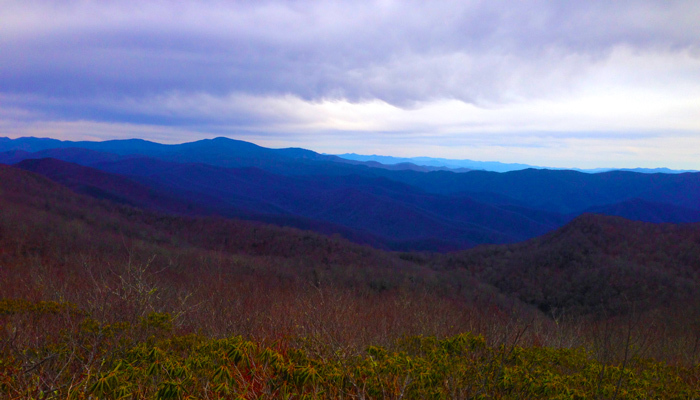 Rocky Top and Thunderhead are two mountain peaks near Cades Cove that stand around an elevation of 5500 ft. Both of these peaks are prominent, but Rocky Top is less overgrown and offers an excellent panoramic view. To reach Rocky Top and Thunderhead, one route is to take the Anthony Creek Trail that begins in the Cades Cove Campground area. From this route, hikers will take the Bote Mountain Trail to the Appalachian Trail. Along the way, you'll pass by Spence Field, another high elevation meadow that is similar to Gregory's Bald. How To Get There: Upon arriving in Cades Cove, follow signs to the Cades Cove Campground. Drive to the end of the campground and you'll see a sign for Anthony Creek and the Crib Gap Trail. This easy trail begins just off of the Anthony Creek Trail a short distance from the Cades Cove Campground. This hike roughly follows Laurel Creek road and it's an excellent hike for seeing wildflowers and mountain laurel in the spring. Additionally, this hiking trail connects with Turkey Pen Ridge Trail and Finley Cane Trail if you want to extend your hike. At 1.6 miles in length, this easy hike is an excellent hike for beginner hikers who want to explore the Cades Cove area. How To Get There: Drive to the Cades Cove Campground/Visitor Center that's located right before the Cades Cove Loop Road. You'll find the Anthony Creek Trailhead at the end of the campground. Hike this trail for less than a mile and it connects to Crib Gap Trail. Be sure to check out these excellent hikes in Cades Cove on your next visit the Smoky Mountains! Need a place to stay that's close to Cades Cove? Check out our cabin rentals in Wears Valley that's located just outside of the Great Smoky Mountains National Park!